Today starts our 14th annual Voorhees Family Art Show here in Asheville, center of the Universe, and I will hang four new pieces - the first (below) really was done in 2010 but never published before. The other three are created from my first experiments with natural dyes - madder root, lac, walnuts and osage orange. Working with natural dyes is where I want to be for my personal work. This was just a brief visit. Below are the rest of the new work - complete with liner notes! When my best friends and I went to England and Wales in 2009 for a Memorial tour for my adopted mother Millie Voorhees, we visited the Welsh National Museum - St. Fagan’s. This is an outdoor museum with every type of dwelling from the stone-age on. Holly bushes surrounded the parking lot so I “borrowed” a few leaves. I had to snip off the points as they drew blood. They were pasted in my drawing journal until I started this piece. 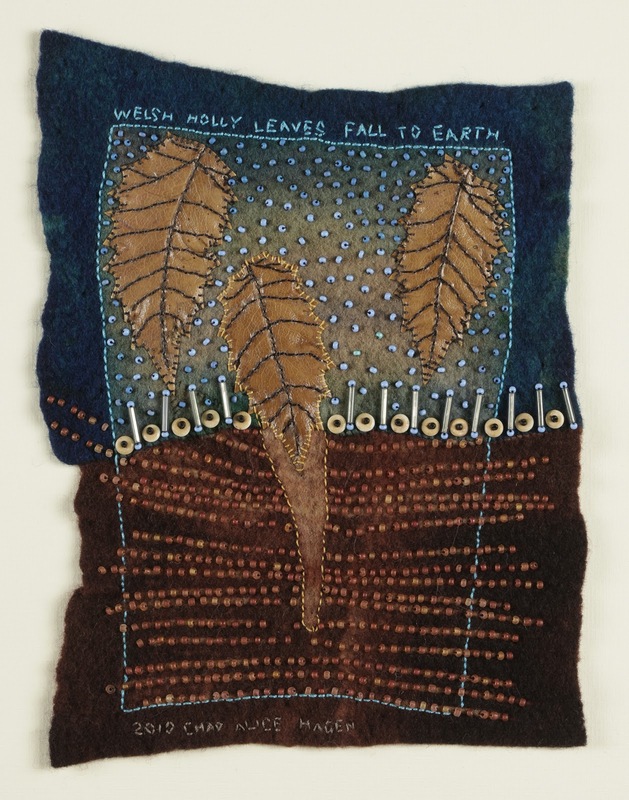 The “falling to earth” imagery comes from a poem by Mendy Knott where she writes of leaves leaping off the trees in Fall because they are so glad to be reunited with the earth. She read this at Millie’s memorial service. The tour, Millie, the leaves and their fall to earth all came together for this artwork. merino wool, sabreset dyes, glass beads, Welsh Holly leaves, linen and cotton thread. 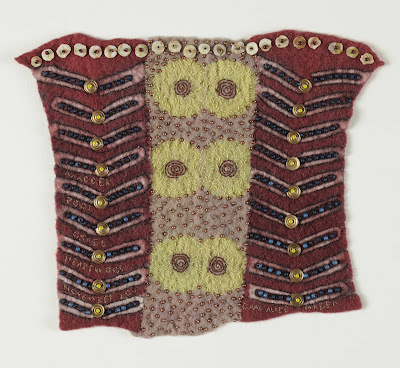 Hand felted, resist dyed, stitched and beaded construction. Walnut Page - Peeling Black Walnuts Under October Skies. When my friend Helen brought over 45 bushels of festering black walnuts I knew that it was time to indulge my long time desire to explore natural dyeing. I have worked with synthetic acid dyes for almost 35 years but was a bit nervous learning a whole new world of plants and chemistry. We sat on the back porch on a wonderful breezy, sunny day in October, surrounded by squirrels scolding us from trees and peeled the dye-rich hulls from the nut. They were rotting and some were full of bugs but the smell was divine and I was completely captured by the ancient history of the black walnut dye. I clamped pieces of hand felted merino wool and fed them to the walnut dye pot. An hour later I reaped my rewards. Thank you Helen. 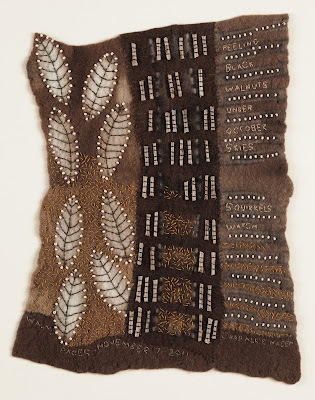 Australian merino wool, resist dyed in hand gathered walnut dye, glass beads, buttonhole thread, weeping cherry twigs. Hand felted, resist dyed, stitched and beaded construction. Page 28 - Seeds Sense the Change (chance) of Seasons. Australian merino wool, resist dyed in Madder root, Lac and Osage Orange natural dyes, glass beads, gold painted pumpkin seeds, button hole thread. 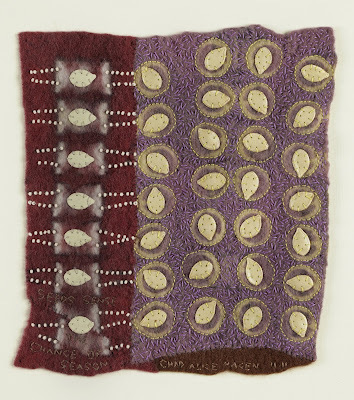 Hand felted, resist dyed, stitched and beaded construction. Page 29 - Madder Root, Osage Heartwood. Sometimes the pieces of resist dyed felt talk to me before they are arranged a certain way. Sometime I stumble blindly, stitching this piece to that and then doing it over again and again. For this artwork, rather helplessly named Madder Root, Osage Heartwood, the Madder dyed side pieces demanded to enclose the lovely circle patterns created with Lac dye over Osage orange. And then naturally, the circles became the Osage heartwood and the madder developed glorious wings with matching hearts of spiral metal sequins. I hope they're all happy now! Australian merino wool, resist dyed in madder root, osage orange and lac natural dyes, glass and metal beads and sequins, button hole thread. Hand felted, resist dyed, stitched and beaded construction. I LOVE, welsh holly leaves fall to earth, really LOVE it. The colors and well, EVERYTHING about it just screams for it to be on my wall! Stunning pieces!!!! Your work is amazing as is your workmanship! All spectacular pieces. Lovely work. Quality work. this is so refreshing, poetic! Your new journey into natural dyes is exciting. Bravo to you. This work is just amazing. It is felt art aat a whole new level. I am humbled. 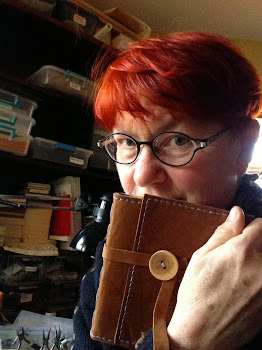 Your work makes my heart go pitter pat! In otherwords quickens my heart - it's so beautiful. Are the pieces for sale? Thank you kind folks. Your comments make my day! And to answer several questions, yes the pieces are for sale. Email me for more information. yea!! I own Walnut pages...beautiful work, Chad, and so nice to see it's sister pieces.